Using my image without attribution is NOT ok! As an ICT integrator and teacher, I place a strong emphasis on teaching my students and colleagues about why and how we attribute online images and creative works. I also take the time to teach them how to find Creative Commons and Public Domain works we have permission to use in our projects, so long as we provide the relevant attribution. As a professional educator and presenter, I endeavour to model best practice with image attribution in my teaching and presentations, sometimes with surprising results – see a post on this topic from 2013. I’m trying to set an example, but I know I’m not perfect. I didn’t always attribute images properly, especially in my early years. Today; however, I discovered why image attribution is so important. 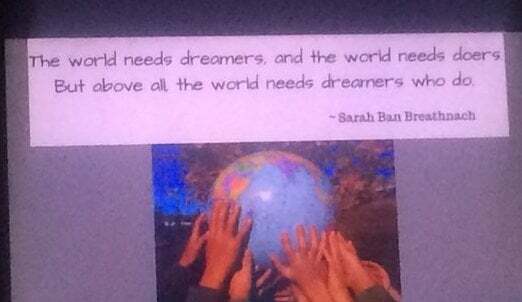 This picture, taken off Twitter, and cropped to avoid publicly identifying the presenter, contains two unattributed images, of which I happen to know the creators. The first image, featuring a quote by Sarah Breathnach happens to be mine. I can’t claim one of the most deeply meaningful quotes I’ve ever found, but I can claim the image. Made in Canva, it was uploaded and prominently featured on my organisation’s website from October 2014 – around July 2015. This happens to be the original, which was not published under a Creative Commons license. . The second image, of children holding up the globe, is by a Global Classroom Project guest blogger, published on our blog here in January 2013. Looking at the copyright statement on the creator’s professional blog, this image is technically copyright. Neither of these images can be sourced through Google Advanced Image Search (usage rights), or through Creative Commons search engines. In fact, there are better CC/PD alternatives that could have been used instead. I have two major issues with the use of these images. Firstly, my image was used (and modified) without permission, either implied or requested. Under normal circumstances, if asked, I would have agreed for this image to be reproduced under a Creative Commons – Attribution – Non Commercial license. Secondly, the image was used in what can be technically described as a commercial presentation held in Australia, organised by an overseas presenter, and requiring payment from attendees. Whether the presenter was paid for this event is not the point. I am not comfortable with other people using my work for these kinds of events, particularly when they use it without permission. Using my images without permission or attribution is NOT ok.
I’m sharing this post in the hope that other people will learn from my experience. Perhaps the presenter in question might read it, and reconsider how he selects and attributes images in future presentations. No hard feelings mate, but if you’d like to use my images in future, please ask. Or at the very least, give them a meaningful attribution. As I recently told my students, I vividly recall the time I sat at the back of a classroom, struggling to stay awake through one of the most mind numbing PowerPoint presentations I’ve ever experienced. In early 2013, I was thrilled to discover an iPad app which opened my eyes to the power of an effective presentation, combining beautiful imagery with minimal text to share a story. That app was @HaikuDeck, and I’ve been using it ever since, sharing my story, and the stories of my colleagues, on the local, national, and international stage. A few days ago, my application to become a HaikuDeck Guru was accepted: and I am thrilled to join a small, but growing international community of storytellers helping to support the ongoing development of one of the world’s best presentation tools. HaikuDeck set my story free, and I’m thrilled to be part of their journey in the years to come. On Saturday night, I returned to where it all began, presenting at the fourth Reform Symposium eConference. Considering my global journey started with attending #RSCON11, and presenting for the very first time at #RSCON3, this was a very special occasion, and I was truly taken aback by the response and interest in my session. With 35 attendees from 6 continents, this is a presentation I will remember for some time to come 🙂 Thankyou to everyone who attended, and thank you to all those wonderful people who’ve sent me feedback on the session. It is greatly appreciated. 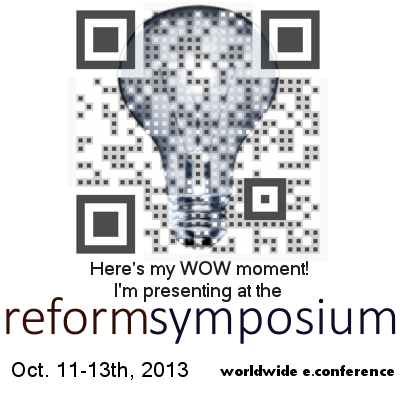 Next weekend will be a special moment on my teaching journey, when I present at the Reform Symposium eConference, the online conference which kick-started my global journey over two and a half years ago. You can find out the exact time, and details on the other (amazing) #RSCON4 sessions, using the official schedule here. Teachers now have access to free quality professional development via current online technologies. Experience this live with thousands of educators from around the globe by attending the 4th annual Reform Symposium Online Conference, RSCON, which takes place October 11th to 13th in conjunction with Connected Educator Month. Attend this free online conference from anywhere that has Internet access. View the schedule online here. Plenaries- Sugata Mitra, 2013 Ted prize winner and instigator of the Hole-in-the Wall experiment and Salome Thomas-EL, Principal EL of the Dr. Oz Show. Steve Bingham, electric violinist, and Laura Oldham, the Book Supplier, will play live. 3 Panel discussions featuring Dr. Alec Couros, Ozge Karaoglu, Nicholas Provenzano, Jackie Gerstein, Steven Anderson, Silvia Tolisano, Joe Dale, Tom Whitby, Pam Moran, Lisa Dabbs, Erin Klein, and Tom Murray. 100+ sessions. Topics include genius hour, the flipped classroom, global projects, mobile learning, game based learning, web 2.0 tools, integrating iPads, e-portfolios, and more. The activities meet Common Core objectives and cover all subjects and age groups. Nominate an educator to receive an EdInspire Award. Takes 5 minutes. Download the flier and program. Connect with over 10,000 educators from 100+ countries and receive conference updates via the FutureofEducation.com community, Twitter (@RSCON4), Facebook, or Pinterest. I am still coming to terms with the fact that I travelled halfway around the world to share my social media journey and experiences with The Global Classroom Project at #iEARN13. Qatar was the venue for my first (three!) international presentations, including my first Global Classroom Workshop, and the launch of my first iEARN project. Here they are, with links to explore further if you wish. I still can’t believe that nearly 50 people attended this workshop, which was live translated from English into Arabic. It seemed to make quite an impact, judging by the frequent informal sessions I held with new iEARN twitter teachers over the days which followed! It was a pleasure to present in front of the @iEARNAustralia management team, who now have a much better understanding of what I’ve been trying to do with our organisation’s Twitter account. This workshop was also the first time I experimented with a bilingual “Find Someone Who” activity as a brief 5 minute introduction to the ‘essence’ of Twitter – short, rapid fire conversations with global partners around a range of issues. One of the unexpected surprises of the iEARN Conference was the invitation to contribute to the Social Media Panel Keynote, created by Khitham Al-Utaibi (@khitamah) and Rebecca Hodges (@ProfHodges). Well done @mgraffin A short, sharp presentation on the relevance of social media that resonated with many. This turned out to be one of the more productive sessions of the conference, where I took the opportunity to share the story of the #globalclassroom travelling scrapbook project, and discuss plans for an iEARN version. I took away some hastily scribbled notes / suggestions, and a list of potential partners. I’m hoping to get this project running by September 2013, and will have to try and sort out the planning / organisation approach over the next week or so. In preparing for my Science, ICT, and the Global Classroom presentation at the Science Teachers’ of Western Australia Conference this weekend, I’ve learnt some valuable lessons about global connections, crafting powerful presentations, and about connecting science to the real world. This is the story of an image, and there’s quite a story to tell .. I first came across this image through Twitter, where it appeared on the Facebook page of a prominent Science communicator in the USA. With the intention of using this quote and image in my presentation, I contacted the owner of the site – only to discover that he didn’t own the image! With his kind assistance, I traced the imaged to the 500px site, where you can view the original version. After leaving a comment on the site, I received an email from the artist in Spain, who was quite surprised to hear from me – for several reasons! Firstly, he had no idea his image was being used in the above form, and secondly he wasn’t particularly happy that the image didn’t (and still doesn’t) attribute him as the artist! With the help of Google Translate, and several emails later, Jordi kindly gave me permission to reproduce the image (and quote) for educational use. But, this whole experience has left me with an important lesson about images on the Internet Just because it’s there, doesn’t mean you have a right to take it and use it. I’ve also learnt that that asking for permission can have some unintended, unexpected consequences. But I’m glad I did. It is hard to believe that #ACEC2012 has been and gone. Yet, I will carry its legacy for many years to come. I took a great deal of confidence and affirmation away from #ACEC2012. Making my presentation debut at Australia’s national ICT conference was a personal milestone, one which I will remember for many years to come. The fact that I had a full house, and received such wonderful feedback on the ‘passion’ of my presentation, was a welcome recognition that my work is valued beyond the emotional roller-coaster of my day-to-day teaching practice. I knew that my work in global education was respected by educators around the world, but I really appreciated the opportunity to sit down and talk to people whose teaching practice and educational outlook are being transformed through their engagement in the #globalclassroom community. I’m a teacher. I may not have my own class, but I’m making an impact. And I’m already looking forward to attending #ACEC2014 in Adelaide! On Wednesday October 1, 2012, I had the wonderful opportunity to present with Nigel Mitchell (@1nbm) on the topic: “Working in the Global Classroom” at theAustralian Computers in Education Conference. Despite some initial technical hurdles, including the fact that Skype was blocked at the school, the presentation was a great success. I hope you will take some time to explore our slides, and watch our UStream recording. You can access, and contribute to our presentation notes here. In several hours time, on October 3, at 10.15AM local time, I will be presenting (with Nigel Mitchell) on ‘Working in the Global Classroom‘ at the Australian Computers in Education Conference in Perth, Western Australia. This is late evening of October 2 for teachers in the Americas, morning of October 3 for teachers in Asia. Please click here to find out when this is in your time-zone. Interact with global educators in real time to discuss the possibilities, challenges, and learning opportunities afforded by global interactions. You can read the full outline here. A key goal of this presentation is to involve our national and international audience through streaming the session LIVE via UStream & inviting global educators around the world to help us write our presentation notes. Please feel free to comment using the #globalclassroom hashtag, and chat with our session participants. This will be our official backchannel to the live / UStream presentation. Please click here to check when this is in your time-zone. We’d also sincerely appreciate it if you’d take some time to share your advice, resources, links, and suggestions for teachers new to connecting and collaborating globally. We are crowd-sourcing our presentation notes in Google Docs, seeking to showcase the power of international collaboration in action. Please tweet this widely – we’d like to make this a truly global resource. Anyone recognise these little characters? On November 15, 2011, I was lucky enough to present alongside Deb Frazier, and members of the #globalclassroom team at the Global Education Conference 2011; sharing our Global Classroom 2011-12 wiki community with the world. Attended by around 25 teachers, from Europe, Asia, Australia, and North America, this presentation was a fantastic opportunity to share, and reflect upon, the incredible efforts of our #globalclassroom teachers in making global connections, establishing projects, and enabling their students’ voices to be heard on the world stage. Global Classroom is already making a significant impact on the lives of students and teachers around the world. We’re imagining a world of global collaboration. TOGETHER, in a small way, we are working to make this world a reality. *The original version of this post was published on The Global Classroom Project blog on November 16, 2011.